AM/FM CD receiver with USB iPod Digital Direct interface, phono input, subwoofer output, Internet stereo radio plus wired and wireless LAN. The proverbial Swiss Army knife of high-end audio receivers. The world is quickly changing in many ways. In some areas these changes are more gradual than others, but nevertheless as time passes they become more and more notable. One of the areas that in some respects have changed drastically, while in others, very little at all, is the world of high-end audio. The real question becomes why is there such a huge gap between the ultra-high tech computerized music and video server systems and the more traditional two channel stereo system. The answer is extremely complex and somewhat difficult to put in a concise format without sounding condescending to either party or indeed the people in-between. Perhaps one answer is that while certain aspects of musical recording and reproduction lend themselves to rapid changes and advances, while others do not. An equally valid answer is that some purists believe that electronic formats are not comparable to those of an analogue nature and thus would prefer to keep things as analogue as possible until they feel more comfortable. The answers are endless as are the arguments for both sides and those in the middle, which is why I was excited by the chance to review the Teac CR-H500NT. Teac has taken the marketplace by storm over the last several years. Their audio products range from price conscious components up to their Esoteric line, which is considered by many contain some of the best reference components in the market today. The CR-H500NT is part of their Reference Series. This series represents the best of the components within the Teac line, however, as you will find out later, it does not come with a price tag which puts it out of the reach of many people. 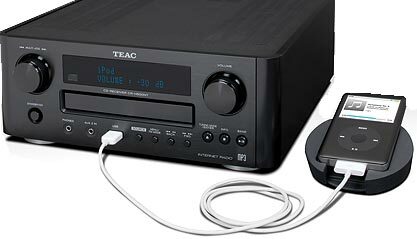 The Teac CR-H500NT is somewhat of a hybrid component. The company refers to it as a "CD receiver with USB/iPod digital direct interface," but even that description only gives a very slight indication of the capabilities of this reasonably priced $799 component. In addition to the CD player, traditional AM/FM tuner, and the ability to play music from an iPod, it also incorporates an internet radio, Moving Magnet Phono Stage, and a music player, which would more aptly be called a music server and player. If those weren't enough features, it also includes the ability to record music from sources as MP3 files on either USB memory sticks or to tape and CD recorders if you prefer. It should be obvious with all this functionality built-in, the "normal" process of setting up the component by connecting speakers, perhaps playing a CD and generally utilizing as much of the features as possible to make sure they were all performing at their best became a little more challenging. It needed to be done in stages until finally it was all ready to really sit down and review the component as a whole. The first part of breaking-in the component was to get it connected to the internet to allow a steady stream of music which would get the amplifier working. Setting up the internet on the CR-H500NT can be done several different ways. It can be done through a wireless connection which can be accomplished by using either the built-in wizard and following the prompts, or for more advanced users, entering all the information manually. One thing to note is that if your wireless network is protected by a WEP key, a passcode to allow access to your network, entering it is somewhat tedious. Unfortunately, the only way you can do this is by pressing the buttons on the front panel. It is not hard, but it takes a little bit of practice. The second way to connect the CR-H500NT to the internet is through a wired connection. In truth, throughout my testing, it did not seem to matter which connection was used. However, if you have the ability to use a wired connection with the unit, you might want to consider it your first choice for several reasons. The first and perhaps most important is that wired connections are normally faster, require less maintenance and in most networks you need not worry about passcodes to access the internet. However you setup the internet, the second thing you will want to do is check to see if there are any downloads available for the component. Once again, the process takes a little getting used to, but it is a fairly simple task if you follow the directions. In the case of the review unit, there was indeed an update which took very little time to install, but consider it somewhat like a computer, you don't have to update the component, but chances are if you do not, you will regret it at a later time. Once the component was connected to the internet and the update installed, setting it up to break-in was fairly straight forward. After picking an internet radio station that transmitted on a 24-hour basis, not all stations do, the equipment was left alone to break-in for approximately 100 hours. The reason for this short period of time revolves around the fact that you can only utilize one source at any time. Therefore, after 100 hours, the source was changed to the CD player and left for another 100 hours. You might have already gathered that reviewing this equipment was not quite as cut and dry as one might have expected. It has so many different options and configurations to choose from, that it is somewhat hard to decide where to start. However, since the CD player is self-contained it seemed the perfect jumping off point, so to speak. With that in mind, the first CD chosen was Simon Rattle and The Berliner Philharmoniker's Shostakovich: Symphonies No 1 and 14 on the EMI Classics Label. Although this two CD set places the bar fairly high on a system because of the complexities of both vocal and instrumental components, the CR-H500NT did not appear to waver is its ability to capture the musical compositions. There was certainly more than enough power from the amplifier to render even the most challenging and demanding passages lifelike and enjoyable. The second CD chosen for the review was Concord Jazz's Super Audio CD Sampler - Volume 2 on their own label. While one might ask why a Super Audio Sampler CD was used, the reason is it contains very well recorded music which sounds good in all its various formats. The CR-H500NT did a masterful job of reproducing the music with poise and dignity. While it seemed to lack some of the upper and lower extensions heard on other systems, these were certainly not so noticeable as to ruin the overall experience. It seemed prudent to review the functionality of the CR-H500NT which was not necessarily dependent upon other parts of the components abilities. As the review progresses you will notice that many of the features on the unit can be used individually or in conjunction as the listener sees fit. However, the iPod is the only source that cannot be recorded to either a USB or analogue audio source, so it seemed only right to move to one of the most popular digital music sources. The CR-H500NT is only certified to work with iPods, a list of which can be found in the unit's manual or on Teac's website. While this does not preclude you from using an iPhone or iPad as the source of the music either of these devices are not entirely supported. The iPhone will ask if you wish to enter airplane mode, which you do not have to do, and the iPad will retain the charge it started with, at least as far as I could tell, but it will not charge. These issues might be addressed in later models, but not in the current one. Compatibility issues aside, the device is perfectly suited to playback any music or podcasts you might have stored on your iPod. The unit�s default setting is direct mode, which means that you use your iPod's player to select music which you are listening to at any given time. Although through the use of the remote you can change the way you access the music to emulate the iPod, it was much easier to use the direct mode. Firstly because you had more control and an interface you would likely be very familiar with, but also because of the limited amount of information on the display, you could find things much faster. Even in direct mode, you could still skip tracks, reply tracks, etc either through the buttons on the unit itself or with the remote. However, if you are more comfortable with selecting through playlists, albums, etc, you can set these modes with the remote as well. Although direct mode was a welcome change, what was even more impressive was the quality of the reproduction of the music from the iPod. When paired with the CR-H500HT, the music bypasses the iPod's internal DAC, and uses the far more robust internal AKM-24bit/192kHz DAC. The high quality DAC makes all the difference when playing either Apple's compressed or lossless formats. In reviewing the unit, I spent hours upon hours playing music from all different genre and the results were always the same. The overall extension, life like quality, imaging and tonality was simply amazing. It was perhaps the closest that this reviewer had ever heard to CD quality sound from Apple's formats. In fact, on Pink Floyd's �Us and Them�, one of my favorite selections to evaluate any component I found a level of complexity that was extremely unexpected. Internet radio was mentioned earlier on in this review. It is fast becoming one of the best ways to experience music both from local sources and foreign ones. The CR-H500HT comes configured with thousands of stations. These stations are grouped in a variety of different manners including countries and genre. One of the nice things is that you are able to simply select either a country, or a genre and country and then go through a list to find a station that suits your specific tastes. Similar to the quality found in the reproduction from the iPod, the music from these stations is usually quite wonderful. What is even better is that you can actually record these stations either to a USB in an MP3 file or to a tape or other recorder without much difficulty. This might not seem useful because of the sheer number of stations, but many internet stations only broadcast at certain times, so the ability to record them for later enjoyment is something that becomes very useful. Of course, like anything where the internet is concerned, the number of radio stations is constantly expanding. Although updates will likely add many stations to the internal list as time goes on, there is another way to add stations which brings us to the next feature of the CR-H500NT, the ability to connect it to a home computer through a web interface. This web interface or radio portal allows you to not only easily store stations you enjoy, but add stations that are not present on the internal station lists. The setup is fairly simple and the benefits are immense. Once again the ability to setup these functions is fairly simple. The manual does a fairly good job of explaining exactly what is involved in either file sharing or media sharing, but in testing on the media sharing function, unlike file sharing, media sharing requires a certain amount of setup on your computer system. However, with the newer operating systems, this is not difficult and the results are worth the effort. Through your LAN or WLAN, the CR-H500NT allows streaming of both compressed and uncompressed (WAVE/WAV) audio files from your PC and D/A conversion is handled by the AKM-24bit/192kHz DAC . Regardless what method you use to get the information to your CR-H500NT, the result is the same. The overall fidelity you will find is improved exponentially. Certainly like any media, the better the recording, the higher resolution the file, and the more bandwidth in some cases you have, to name a few things, will impact your experience. However, when testing on a nearly full network, with fairly poor quality files, the difference was like night and day. You will never want to hear your music played from your computer again, once you have the system setup. 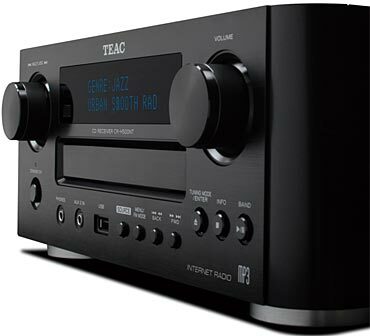 Sadly there is not nearly enough room in this review to remotely cover all the features available on the Teac CR-H500NT. In addition to those mentioned, there are also additional inputs, the ability to play a turntable, music from USB memory devices, the ability to set a timer, set the time, and even connect a subwoofer if you would like to augment your speaker system into a full 2.1 application. The unit itself is built extremely well and laid out so that it is easy to access all the inputs and outputs. The display is somewhat small although it does have two lines, so you are able to read most of the information you need to do what is required to access the functions. Most of the actual functionality is accessed through the buttons on the front of the unit. The remote itself provides some additional functionality such as accessing the other iPod modes, but it mainly provides access to the features you would expect from any receiver and CD player. The Teac CR-H500NT is certainly a welcome addition to the Teac Reference Line. At $799, it offers amazing functionality, versatility and overall performance. There is very little that the unit is not capable of doing, although sadly some of the interfaces are more complex than one might like. In the US model, there is no RDS, so station information is not available like it is in the European version, but even that takes little away from its place as an overall outstanding unit that bridges the gap between traditional two-channel stereo and the world of computers and the internet. I would highly recommend the CR-H500NT looking for a superior quality component that incorporates all the newest technologies in a fairly easy to use package. Type: AM/FM CD receiver with USB iPod Digital Direct interface (no external decoder needed), phono input, sub-woofer output, Internet stereo radio, wired and wireless LAN. (Streams compressed and uncompressed PC audio files). Wireless LAN (IEEE802.11b/g). WLAN antenna included.